David Tennant (born David John McDonald; 18 April 1971) is a Scottish actor. Already a well-known theatre actor, Tennant achieved wider fame for his TV role as the Tenth Doctor in BBC's Doctor Who as well as in Casanova and Einstein and Eddington, and his film role as Barty Crouch, Jr. in Harry Potter and the Goblet of Fire. Tennant was born David John McDonald on 18 April 1971 in Bathgate, West Lothian and grew up in Ralston, Renfrewshire, where his father (the Reverend Alexander ("Sandy") McDonald) was the local Church of Scotland minister (and Moderator of the General Assembly of the Church of Scotland in 1997). Tennant was educated at Ralston Primary and Paisley Grammar School where he enjoyed a fruitful relationship with English teacher Moira Robertson, who was among the first to realise his true potential. He then earned a bachelor's degree from the Royal Scottish Academy of Music and Drama, where he was friends with Louise Delamere. At the age of three, Tennant told his parents that he wanted to become an actor because he was a fan of Doctor Who. Although such an aspiration might have been common for any British child of the 1970s, Tennant says he was "absurdly single-minded" in pursuing his goal. He adopted the professional name "Tennant" — inspired by Neil Tennant, of the Pet Shop Boys — because there was another David McDonald already on the books of the Equity union. His second choice for a stage name was David Brandon and his third choice was Chris McDonald. Tennant's first professional role upon graduating from drama school was in a staging of The Resistible Rise of Arturo Ui co-starring Ashley Jensen, one of a few plays in which he performed as part of the agitprop 7:84 Theatre Company. Tennant also made an early television appearance as a transsexual barmaid in Rab C Nesbitt. Tennant met comic actress and writer Arabella Weir during the making of the BBC's Takin' Over The Asylum in which they both appeared. When he moved to London shortly afterwards he lodged with her for five years and became godfather to her youngest child. He has subsequently appeared alongside Weir in many productions; as a guest in her spoof television series, Posh Nosh; in the Doctor Who audio drama Exile and as panelists on the West Wing Ultimate Quiz on More4. Tennant developed his career in the British theatre, frequently performing with the Royal Shakespeare Company for whom he specialised in comic roles such as Touchstone in As You Like It, Antipholus of Syracuse in The Comedy of Errors (a role he recorded for the 1998 Arkangel Complete Shakespeare production of the play) and Captain Jack Absolute in The Rivals, although he also played the tragic role of Romeo in Romeo and Juliet. (He also appeared the Arkangel series as Launcelot Gobbo in The Merchant of Venice and Mercutio in Romeo and Juliet, both in his natural accent.) It was announced in 2007 that he would return to the RSC as Hamlet and Berowne, for which see below. In 1995, Tennant appeared at the Royal National Theatre, London, playing the role of Nicholas Beckett in Joe Orton's What the Butler Saw. The plot required Tennant to appear near-naked on stage, wearing nothing but a police hat. During the Christmas season of 2002, Tennant also starred in a series of television commercials for Boots the Chemists..
Tennant appeared in several high-profile dramas for the BBC, including Takin' Over the Asylum (1994), He Knew He Was Right (2004), Blackpool (2004), Casanova (2005) and The Quatermass Experiment (2005). In film, he has appeared in Stephen Fry's Bright Young Things, and as Barty Crouch Jr. in Harry Potter and the Goblet of Fire. One of his earliest big screen roles was in Jude (1996), in which he shared a scene with his Doctor Who predecessor Christopher Eccleston, playing a drunken undergraduate who challenges Eccleston's Jude to prove his intellect. Tennant's name was put forward as a possible candidate for the role of the Ninth Doctor in 2004, although the role eventually went to Christopher Eccleston. With Eccleston's announcement on 31 March 2005 that he would not be returning for a second series, the BBC confirmed Tennant as his replacement in a press release on 16 April 2005. He made his first, brief appearance as the Tenth Doctor in the episode "The Parting of the Ways" (2005) after the regeneration scene, and also appeared in a special 7-minute mini-episode shown as part of the 2005 Children in Need appeal, broadcast on 18 November 2005. He began filming the new series of Doctor Who in late July 2005. His first full-length outing as the Doctor was a sixty-minute special, "The Christmas Invasion", first broadcast on Christmas Day 2005. Tennant has expressed enthusiasm about fulfilling his childhood dream. He remarked to an interviewer for GWR FM, "Who wouldn't want to be the Doctor? I've even got my own TARDIS!" In 2006, readers of Doctor Who Magazine voted Tennant "Best Doctor", over perennial favourite Tom Baker. In 2007, Tennant's Doctor was voted the "coolest character" on UK television in a Radio Times survey. Tennant had previously had a small role in the BBC's animated Doctor Who webcast Scream of the Shalka. Not originally cast in the production, Tennant happened to be recording a radio play in a neighbouring studio, and when he discovered what was being recorded next door managed to convince the director to give him a small role. This personal enthusiasm for the series had also been expressed by his participation in several audio plays based on the Doctor Who television series which had been produced by Big Finish Productions, although he did not play the Doctor in any of these productions. In 2004 Tennant played a lead role in the Big Finish audio play series Dalek Empire III. He played the part of Galanar, a young man who is given an assignment to discover the secrets of the Daleks. In 2005, he starred in UNIT: The Wasting for Big Finish, recreating his role of Brimmicombe-Wood from a Doctor Who Unbound play, Sympathy for the Devil. He also played an unnamed Time Lord in another Doctor Who Unbound play Exile. UNIT: The Wasting, was recorded between Tennant getting the role of the Doctor and it being announced. He also played the title role in Big Finish's adaptation of Bryan Talbot's The Adventures of Luther Arkwright (2005). In 2006, he recorded abridged audio books of The Stone Rose by Jacqueline Rayner, The Feast of the Drowned by Stephen Cole and The Resurrection Casket by Justin Richards, for BBC Worldwide. Tennant is close friends with actress Billie Piper. Tennant continued to play the Tenth Doctor into the revived programme's fourth series in 2008. However, on 29 October 2008, Tennant announced that he would be standing down from the role after three full series. He will play the Doctor in four special episodes to be broadcast in 2009. The Daily Mirror has also reported that Tennant is forbidden from attending Doctor Who fan conventions while playing the role. He said at the Children in Need concert that his favourite Doctor Who story is Genesis of the Daleks. He made his directorial debut directing the Doctor Who Confidential episode that accompanies Steven Moffat's episode "Blink", entitled "Do You Remember The First Time? ", which aired on 9 June 2007. In 2007, Tennant's Tenth Doctor appeared with Peter Davison's Fifth Doctor in a Doctor Who special for Children in Need, written by Steven Moffat and entitled "Time Crash". This was the first "multi-Doctor" story in the series since The Two Doctors in 1985. Tennant also later performed alongside Davison's daughter in the 2008 episode The Doctor's Daughter with her taking the title role as "Jenny". Tennant's casting in Doctor Who has not prevented him from taking on other roles. He was seen in early December 2005 in ITV drama Secret Smile. His performance as Jimmy Porter in Look Back in Anger at the Theatre Royal, Bath and Lyceum Theatre, Edinburgh was recorded by the National Video Archive of Performance for the Victoria and Albert Museum Theatre Collection. He revived this performance for the anniversary of the Royal Court Theatre in a rehearsed reading. In January 2006, he took a one-day break from shooting Doctor Who to play Richard Hoggart in a dramatisation of the 1960 Lady Chatterley's Lover obscenity trial, The Chatterley Affair. The play was written by Andrew Davies and directed by Doctor Who's James Hawes for the digital television channel BBC Four. Hoggart's son Simon Hoggart praised Tennant's performance in The Guardian newspaper. On 25 February 2007, Tennant starred in Recovery, a 90-minute BBC1 drama written by Tony Marchant. Tennant played Alan, a self-made building site manager who attempted to rebuild his life after suffering a debilitating brain injury. His co-star in the drama was friend Sarah Parish, with whom he had previously appeared in Blackpool and an episode of Doctor Who. She joked that "we're like George and Mildred - in 20 years' time we'll probably be doing a ropey old sitcom in a terraced house in Preston." Later in 2007 he starred in Learners, a BBC comedy drama written by and starring Jessica Hynes (another Doctor Who co-star, in the episodes "Human Nature" and "The Family of Blood"), in which he played a Christian driving instructor who became the object of a student's affection. Learners was broadcast on BBC One on 11 November 2007. Tennant had a cameo appearance as the Doctor in the 2007 finale episode of the BBC/HBO comedy series Extras alongside Ricky Gervais. In 2008 Tennant played Sir Arthur Eddington in the biopic Einstein and Eddington filmed in Cambridge and Hungary a BBC and HBO co-production, with Andy Serkis depicting Albert Einstein. He is set to appear in Taggart. Tennant is the voice behind the 2007 advertising campaign for catalogue retailer Argos, although he uses an Estuary English accent as in his role as the Doctor and not his natural Scottish voice, but for adverts for The Proclaimers 2008 album and learndirect's in June 2008 he uses his own accent. Tennant appeared in Derren Brown's Trick or Treat. In the 26 April–2 May issue of TV & Satellite Week Brown is quoted as saying "One of the appeals of Doctor Who for David is time travel, so I wanted to give him that experience. He was open and up for it, and I got a good reaction. He's a real screamer!". The episode aired on Channel 4 on 16 May 2008, and showed Tennant apparently predicting future events correctly by using automatic writing. Tennant also returned for the final episode of the series with the rest of the participants from the other episodes in the series to take part in one final experiment. Tennant appeared in the 2008 episode "Holofile 703: Us and Phlegm" of the radio series Nebulous (an affectionate parody of Doctor Who) in the role of Doctor Beep, using his Lothian accent. On the March 13, 2009, David Tennant presented Comic Relief with Davina McCall. He also mimed playing guitar with band Franz Ferdinand on a special Comic Relief edition of Top of the Pops. Despite his recent focus on television work, he has described theatre work as his "default way of being". It was announced on 30 August 2007 that he would join the Royal Shakespeare Company (RSC), to play Hamlet (alongside Patrick Stewart) and Berowne (in Love's Labours Lost) during 2008. From August to November 2008 he appeared at the Courtyard Theatre in Stratford-upon-Avon as Hamlet, playing that role in repertory with Berowne that October and November. Hamlet transferred to the Novello Theatre in London's West End in December 2008, but Tennant suffered a prolapsed disc during previews and was unable to perform from 8 December 2008 until 2 January 2009, during which time the role was played by his understudy Edward Bennett. He returned to his role in the production on 3 January 2009, and appeared until the run ended on 10 January. In December 2005, The Stage newspaper listed Tennant at No.6 in its "Top Ten" listing of the most influential UK television artists of the year, citing his roles in Blackpool, Casanova, Secret Smile and Doctor Who. 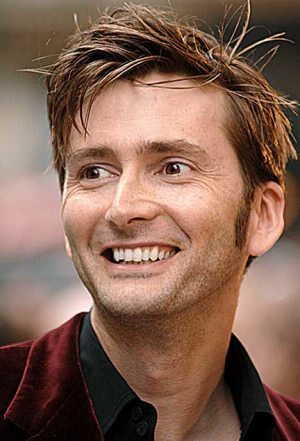 In January 2006, readers of the British gay and lesbian newspaper The Pink Paper voted Tennant the "Sexiest Man in the Universe" over David Beckham and Brad Pitt. A poll of over 10,000 women for the March 2006 issue of New Woman magazine ranked him 20th in their list of the "Top 100 Men". In October 2006, Tennant was named as "Scotland's most stylish male" in the Scottish Style Awards. He was named "Coolest Man on TV" of 2007 in a Radio Times survey. He also won the National Television Awards award for Most Popular Actor in 2006, 2007 and 2008. He was voted 16th Sexiest Man In The World by a 2008 Cosmopolitan survey. He was ranked the 24th most influential person in the British media, in the 9 July 2007 MediaGuardian supplement of The Guardian. Tennant also appeared in the paper's annual media rankings in 2006. In December 2008 Tennant was named as one of the most influential people in showbusiness by British theatre/entertainment magazine The Stage, making him only the fifth actor ever to achieve a ranking in the top 20 (in a list typically dominated by producers and directors). One of the editors for The Stage said that Tennant placed highly on the list because he was "the biggest box office draw in recent memory". Tennant has a brother, Blair, and a sister, Karen. His mother, Helen McDonald, died on 15 July 2007 of cancer. His father, Sandy McDonald, appeared in a cameo non-speaking role as a footman in the Doctor Who episode "The Unicorn and the Wasp". Tennant traced his family tree in an episode of BBC One's popular genealogy series Who Do You Think You Are?, broadcast on 27 September 2006. His episode explored both his Scottish ancestry and that from Northern Ireland, against the backdrop of the Troubles in the latter. Tennant's maternal great-great-grandfather, James Blair, was a prominent Ulster Unionist member of Derry City Council after the partition of Ireland. Tennant displayed discomfort after learning of his great-great-grandfather's membership in the Orange Order. The programme also revealed that Archie McLeod, the husband of Nellie Blair who once played with Derry City, was Tennant's grandfather. Tennant is now a member of the club's Exiles Supporters Club. According to an interview in issue 375 of Doctor Who Magazine, Tennant drove a Škoda in which he was caught twice on the same day on the M4 for speeding while returning to London from Cardiff in October 2006. On Top Gear on 23 December 2007, David said that his Škoda had been taken in for servicing, and it was no longer financially viable, and by the time the episode had aired, he had traded it in. Tennant drives a Toyota Prius; a supporter of ecologically friendly technologies, in 2008 Tennant was voted "Greenest Star on the Planet" in an online vote held by Playhouse Disney as part of the Playing for the Planet Awards. Tennant has been a supporter of the Labour Party and appeared in a Party political broadcast for them in 2005. He is a celebrity patron of the Association for International Cancer Research. In December 2008, Tennant underwent surgery for a prolapsed disc.